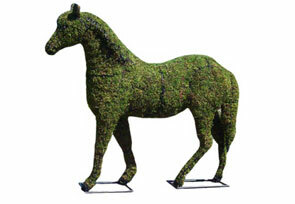 Explore our guide on how to make and plant Topiary frames, topiary animals, topiary cats, topiary horses and more! Our moss animal topiary forms add a touch of adventure and fun that is sure to bring a smile to all who visit your garden creation or create your own following the guidance below. Each topiary wire form comes with Sphagnum moss. Sphagnum moss is generally regarded as the best performing substrate due to its homogeneity and ability to absorb air and water with great efficiency. Our frames is hand woven of durable steel, and double coated with epoxy to discourage rust. Many of the larger forms are designed in two pieces to allow easy access to the interior. Add Sphagnum moss to make your own moss topiary using the frame as your base. These guys are popular during the holidays and come alive when the lights are turned on. Add plants around them for a garden look. Wear a pair of work gloves while working with chicken wire to avoid incurring inadvertent pokes, cuts and scrapes. Spring green frogs, majestic elephants, purring cats, fluffy rabbits. Animals have always lifted our spirits and brought joy to our lives. What fun, then, to introduce ‘botanical animals’ to your garden! A ‘Creeping Jenny’ cat on your windowsill, ‘Hens & Chicks’ tyrannosaurus in the forest, ‘Woolly thyme’ poodle on the patio, ‘Periwinkle’ alligator by the pool or ‘Bugleweed’ dachshund guarding the back door. Choose an animal that is meaningful to you, or to someone you love. 1. PLANT TEXTURE: Take a few moments to look at your animal. Then look for plants which best represent it. Fur, feathers, mane; smooth, fluffy, scaly. Picture your animal dressed in plants. Don’t forget detail: whiskers in kittens, stripes for bees, and eyes for personality! Plant color can create a pattern in your animal. 2. SCALE: Smaller leaf plants work best on smaller animals. The idea is to compliment, not overwhelm the form. 3. CULTURE: It is best to use plants that like the same conditions. We tend to use succulents which are drought tolerant. Rockery type plants which are invasive and low growing make great topiaries. Soak the moss filled form in water and let drain. Snip the plastic connecting ties and open the form into its parts. (This is exclusive to Green Piece Garden Art) Pull out some of the moss. Remove a little of the soil from around the root ball and insert your plant into the form. Wiggle the leaves up through the wires. Repack the moss around the roots. When planted, reattach the form with the cable ties provided. If using B or C above, water with starter fertilizer 10-52-10 & keep in a shaded area, out of the wind for several days before moving to the selected area in your garden. Check for water daily, as you would a hanging basket. Fertilize every other week with a 20-20-20. Below is an example on how we plan to make a topiary! With the horse in mind, let's go through our five steps. The body can be any low growing plant to give a smooth look. We tend to use sedums as they are drought tolerant. (Pick something colorful for your carousel horse eg. Tri-color sedum.). And eyes. Eyes of hens and chicks, colored stones, cacti, give personality. Don't 'hold your horses'; look around your garden or local garden center and think "horse" while contemplating plants. Going back to your original horse, does it have a pattern? The painted horse could have a plant that comes in two colors eg sedum acre in the green and gold. Can't you just picture it? The use of color is always fun. Color can create pattern for your animal. It can also be an unexpected bonus when your plant flowers. For contrast the horse could have a dark mane and tail, and light body (or visa versa) Scale is simple: the smaller the animal the smaller leaf plants work best. The idea is to compliment not overwhelm the form. Again, this is simple. Whatever plants you choose to represent your animal, they all should like the same conditions. Having said this there are exceptions. If you are going to plant in the ears, legs, any of the smaller portions of the animal, these tend to dry out faster than the body. For this reason we tend to leave these parts un-planted as they look great just left moss. We use plants to highlight the rest of the form. This is just a personal decision. Are you having a garden party and need spectacular, instantly? Plant every 2 inches. If you plan to watch the season's growth unfold, plant every 4 to 6 inches. By now you have the situation reined in. Choose an animal that is meaningful to you or someone you love. Then, well, just 'horse around'!